This is another example of a signed sketch in water colour. It shows sky, sand, beach and a town in the distance. 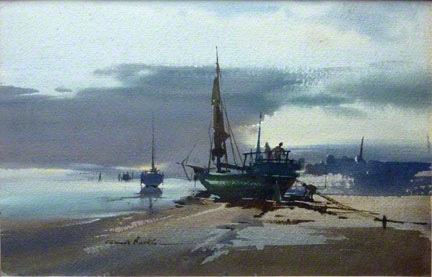 The Claude Buckle painting characteristics very much stand out, use of subdued colour, strong representative style, showing the sky, the sea, the foreground boat and the distant town. Notice also that a lot of the detail of the picture is left to the imagination of the viewer. Courtesy David Patrick O'shea. Created in 1970.